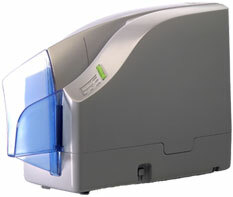 The New CX30 CheXpress is a small footprint, dual sided, dual endorsement, dual Micr read Remote deposit scanner. Images are scanned, displayed and electronically processed before your customer and become immediately available for further processing or verification. The high quality images mean improved OCR/ICR recognition of machine print, signatures and other information. The TS200 connects to your PC via USB interface with no additional cost.